Marshall Compactor, Automatic, Heavy-Duty Rotating 4in Mold - Gilson Co.
MS-5 Marshall Compactor, Automatic, Heavy-Duty Rotating 4in Mold compacts a 4in (102 mm) asphalt specimen into a rotating-base mold and can easily be adapted to compact 6in (152mm) samples with a conversion kit, sold separately. Heavy-duty frame reduces structural and mechanical wear and tear during operation. 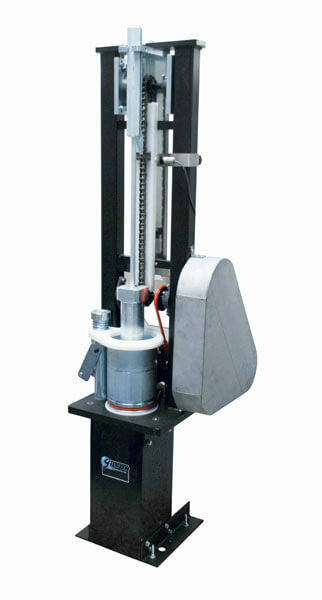 The tapered-foot hammer and rotating base plate produce a consistent kneading action during compaction. Molds are secured with a cam-action lever assembly, and an automatic counter shuts off the unit at completion of the compaction process. An oak pedestal with steel plate, automatic counter, 10lb (4.5kg) tapered-foot hammer, package of paper discs, and 4in mold, base and collar assembly are included. The MSA-113 6in Marshall Compactor Hammer Assembly (Heavy-Duty) and MSA-106 6in Marshall Compaction Mold Set, available separately, converts the MS-5 models to compact 6in samples.